Doña Tomás is a popular eatery in Oakland’s Temescal District at 5004 Telegraph Ave. serving classic Mexican dishes. Doña Tomás uses as many sustainably grown and organic produce and meats as is possible sourced in the Bay Area. I went there with my friend Jan after the obligatory visit to Ikea. I hadn’t seen Jan in about 7 years, but like all good friends we picked up like it was yesterday. It was fun to catch up in the lively atmosphere with the Sunday brunch crowding the dinning room. The patio was closed because of the smoke from the Camp Fire. Chef Dona Savitsky worked her way through the kitchens of San Francisco before opened Doña Tomás in 1999 in Oakland’s Temescal District. In 2003 she opened Tacubaya Taqueria . Tacubayal is a colorful causal dining taqueria in the trendy Berkeley's Fourth Street shopping district. Doña Tomás is closed on Mondays and check website for lunch and dinner times. We saw these signs in windows all over the East Bay. I love Oakland for their bold attitude! 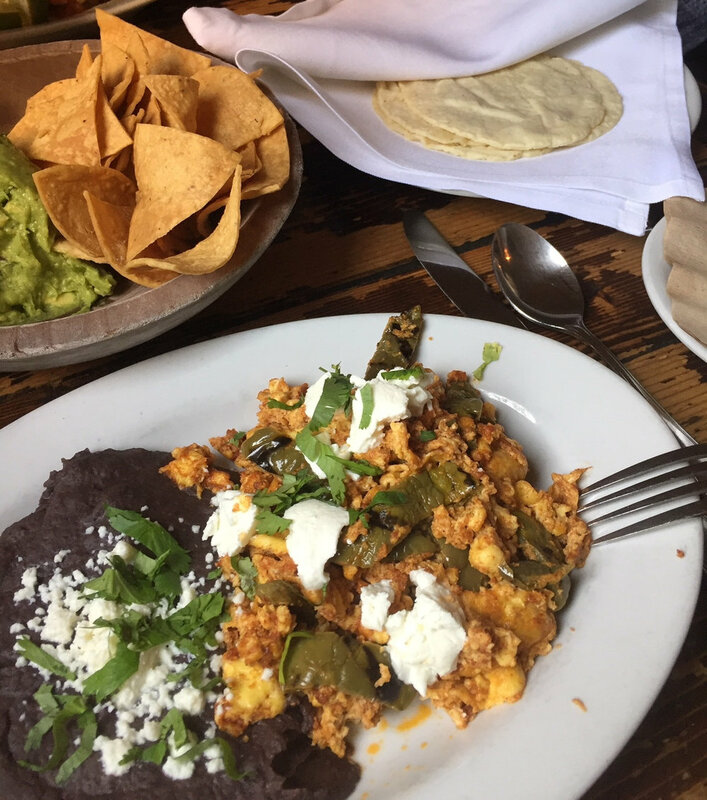 Jan ordered the Huevos Revueltos which is scrambled eggs with chorizo, nopales and goat cheese, cilantro, puréed black beans and warm corn tortillas. Nopales is prickly pear cactus that is roasted. William Sonoma says, “They have a flavor that recalls both sorrel and asparagus and are used in salads, side dishes and with eggs.” I had a bite Jan’s meal and found it had the same rich balance of flavors that Doña Tomás is well known for serving. Tacos Desayunos makes my mouth water just looking at these tacos that tasted so good! Tacos Desayunos translates to breakfast taco comes with two corn tacos, whole pinto beans, cheese, rajas, pico de gallo, avocado and cilantro, tomatillo-guajillo salsa, each topped with a fried egg. The salsa is made with roasted poblanos and rajas is strips of roasted poblanos. I was so happy with my meal! The rich depth of flavors that from the roasted poblanos just made me feel like I was eating real food that someone put together with thought about the end product. It also reminded me how these simple ingredients can come together to make a meal. After eating Jan and I walked around the Temescal District checking out the shops. The Temescal District is commercial and residential properties along Telegraph Avenue and adjoining areas along Telegraph Avenue from 40th to 66th Street, also the Berkeley border, This are has an eclectic mix of shops, eateries in a residential neighborhood. It wasn’t an adventure to find a parking space. They are doing some construction and I captured this huge crane. Another sight I don’t see much of in Mount Shasta.